Walking home the other day I spotted the first tiny grapes growing on a lush green vine. 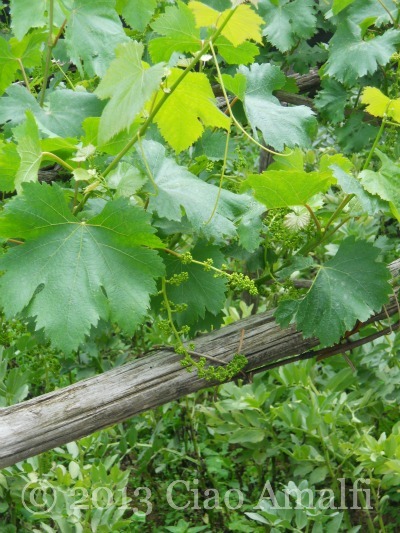 Spring has been very rainy this year, and the vines and plants seem to be loving it! Below this grape vine the owners had planted fava bean plants very early this spring, which is pretty common in the area. I’ve enjoyed watching the plants growing and the long bean pods forming. Then one day they’re gone! Probably to make a delicious dish of pasta e fave. Yum! It’s fascinating to watch out how locals use such small terraces of land to produce so much throughout the year. 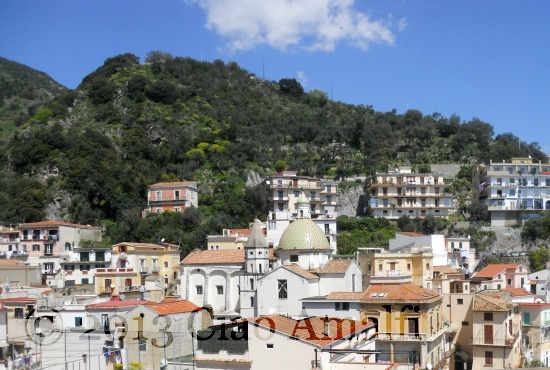 I dream of having my own small plot of land on the Amalfi Coast one day! Spring came late and all at once this year. 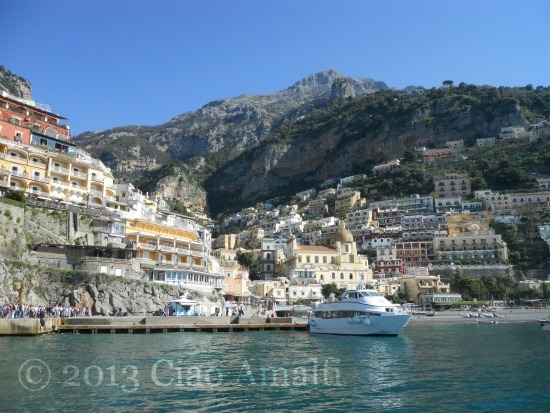 The villages along the Amalfi Coast went straight from overcast wintry days to the buzz of activity rushing to prepare for the busy season seemingly overnight. The flowers loved all the rain and suddenly burst in bloom last month. Speaking of flowers, that’s precisely why I found myself in Positano one morning last month. With the blue sky and sunshine beckoning, I followed a whim and took the early boat from Amalfi to Positano to see the wisteria. And, my oh my, was it ever a show! Stepping off the ferry in Positano ... wisteria, here I come! Positano is such a dreamy place and so very different from Amalfi. Even I feel like I’m on vacation when I step off the ferry and look up at the colorful houses stacked up the side of the mountain. With the restaurants overlooking the beach and the sun shining, there’s an air of isolation that adds so much charm when you’re on holiday. Boats come and go, but the rest of the world feels a million miles away. It was still pretty quiet when I stepped off the ferry and I didn’t meet too many people while heading to the center of the village just below the Church of Santa Maria Assunta. Just at the base of the staircase where you start the climb up toward the church there is a wall that is covered with wisteria vines. The few earlier rising tourists who were out exploring were sitting around the steps or enjoying coffee at a restaurant nearby. The air was filled with the sweet and spicy scent of wisteria along with freshly brewed espresso and morning pastries from a bar just a few steps away. The wisteria vines seem such a natural part of the buildings in Positano, like they’ve been delicately draped across the balconies and pergolas to make them even more captivating. The scent of these blossoms was simply intoxicating. I sat down nearby and breathed in deeply, wishing I could somehow capture and hold onto the scent. If you haven’t smelled wisteria before, it’s kind of like vanilla in that it is warm, sweet and spicy all at once. It somehow combines the sweetness of jasmine with the first sunshine after a gloomy winter into a delicate and spicy scent. It’s good for the soul, that’s what it is. An intoxicatingly spicy and sweet scent - heavenly! I was so taken by the wisteria that it wasn’t until I got home and downloaded the photos that I realized this shot above had the Li Galli islands perfectly framed in the upper left. I tucked one of those purple blossoms right there into my notebook and smelled it all the way home. After tearing myself away from the wisteria blossoms near the beach I started to climb slowly up the narrow passageways of Positano. I could smell these incredible wisteria blossoms before I turned the corner! One deep red building was covered with wisteria, especially one balcony that must have been gorgeous from the inside. Just imagine how beautiful your house would smell! I kept climbing and climbing until I reached a pretty little piazza with a gorgeous pergola full of wisteria blossoms. I happened to bump into a friend from Amalfi while wandering the streets with camera in hand and he asked what brought me to Positano. I pointed up to the pergola of cascading wisteria we just happened to be standing under. “Ah, the glicine.” That’s the Italian word for wisteria. He seemed a bit perplexed why I would come from Amalfi to Positano to see the wisteria, but when I pointed out that it’s simply more beautiful in Positano even the Amalfitano had to agree. It really is something! Every little village on the Amalfi Coast has its own character, and even the weather can vary noticeably from village to village. Positano is nearly always warmer than Amalfi throughout the year and significantly warmer than Ravello and Scala, which are located 350-400 meters above sea level. When I went to see the wisteria and found it nearly in full bloom in Positano it was just beginning to blossom in Amalfi and Ravello. There’s just something about the climate difference that makes it grow better and bloom incredibly in Positano. Even the parking area in Positano is gorgeous! 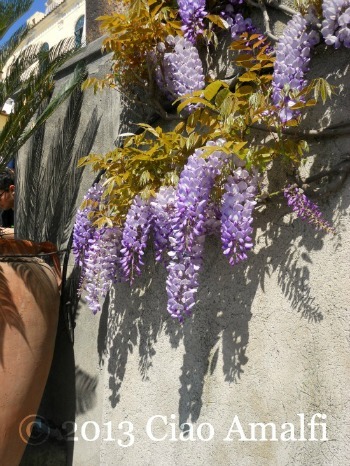 I was happy that the sun was shining and I had the chance to catch the wisteria at its peak in Positano. The petals were just starting to gentle fall, scattering in the sea breeze like a spring snowfall. Last year I missed the best time to see the wisteria because the weather turned bad just at the moment they were at their best. Two years ago I went and had fun discovering the Wisteria Wonderland in Positano. That time I had a picnic and soaked up the sun on the beach, but this time I sat and enjoyed a cappuccino while working on the outline for an exciting project I hope to be working on soon. Wisteria with your morning cappuccino? Yes, please! Yes, this is a yearly tradition that I hope to continue. If you come to the Amalfi Coast in the early spring, the water may still be chilly for a swim and the villages still coming to life after the winter, but if you happen to catch the wisteria blooming in Positano it makes up for everything else! Like I said, it’s good for the soul. I suppose if you lived in Georgia life might give you peaches. Perhaps oranges if you call the Sunshine State home. 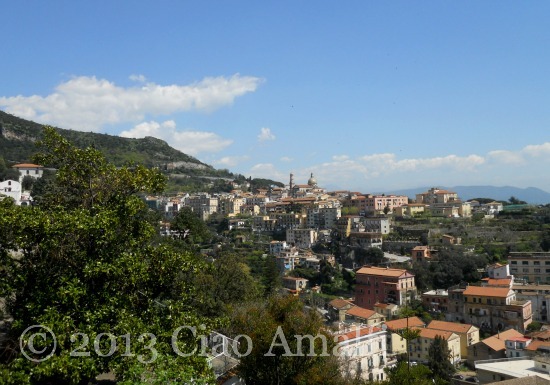 On the Amalfi Coast life really does give you lemons … and a lot of them! They’re stacked up in baskets at the markets and fruit and veggie shops and hanging on the trees just about everywhere you go. The choice of what you might do with the lemons life gives you is wonderfully rich on the Amalfi Coast. You could make limoncello, always a good choice, or you could squeeze it fresh over a salad or fish, make lemon risotto or some good old fashioned American-style lemonade. I was in the mood for baking recently, and so I pulled out one of my favorite dessert cookbooks. 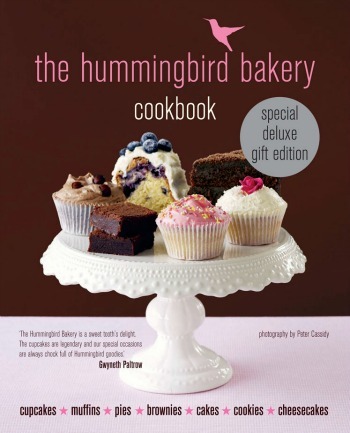 To say I love The Hummingbird Bakery Cookbook is the understatement of the anno. After being introduced to the cookbook from a friend, I stopped in The Hummingbird Bakery in South Kensington (and again in Notting Hill!) in London last March. They had chocolate cupcakes with mint frosting. I was smitten. Since then I’ve had great success with every single recipe I’ve tried from the cookbook. And, oh, have I tried some! I’ve introduced my husband’s Italian family to the wonderful world of cupcakes and brownies. The cupcakes–particularly the cream cheese frosting–have been a huge it, and the brownies are now specially requested at holidays. Oh, and you should see what happens when you introduce Italians to home-baked chocolate chip cookies! You’d think they were the best thing since chocolate chip cookies. Oh … wait … well, you get the idea. Since there’s just the two of us and neither my husband nor I are big on sweets, I rarely make dessert except for family gatherings or holidays. 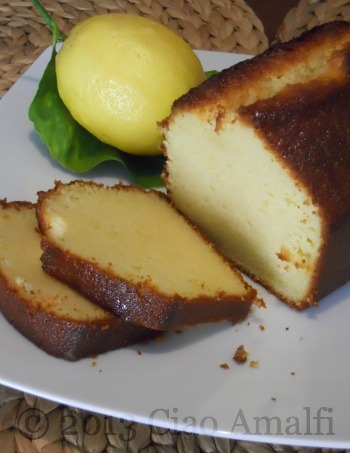 Yet I do love the classic lemon cake that is very popular on the Amalfi Coast. Yet, a whole cake is just too much for us to ever hope to finish alone. I’ve been eyeing the pound cakes and loafs in The Hummingbird Bakery Cookbook lately and decided to give the Lemon Loaf of shot since it’s a lot smaller than the recipe I have for lemon cake in a bundt pan. Lemon pound cake and tea ... yum! Let’s just call this my English twist on an Amalfi Coast tradition! Taking the photos was hard work and was duly rewarded with another slice of cake. Then I snapped a photo on my cell and sent it to my husband promising to try not to eat it all before he came home. Yes, this is one of those cakes that requires photographic evidence. Yum ... would you like a slice? I wish I could share a slice of this lemon pound cake still warm from the oven. But the second best is to share with you the recipe so you can enjoy it at home! Put the sugar, eggs and lemon zest in a freestanding electric mixer with a paddle attachment (or use a handheld electric whisk) and beat until well mixed. up to high speed and beat until the mixture is light and fluffy. Turn the mixer down to low speed, pour in the melted butter and beat until well incorporated. with a palette knife. Bake in the preheated oven for about 45–55 minutes, or until golden brown and the sponge bounces back when touched. For the lemon syrup: While the cake is baking, put the lemon juice and zest, sugar and 200 ml water in a small saucepan and bring to the boil over low heat. Boil until it has reduced by half, or until it has a thin syrup consistency. When the hot cake comes out of the oven, pour the syrup all over the top. Leave to cool slightly in the tin before turning out onto a wire cooling rack to cool completely. Beautiful and easy to follow recipes! Thank you to Ryland, Peters & Small for allowing me to share The Hummingbird Bakery’s recipe for Lemon Loaf! The Hummingbird Bakery Cook Book Deluxe Edition is published by Ryland Peters & Small at £20.00 and is available from www.rylandpeters.com. 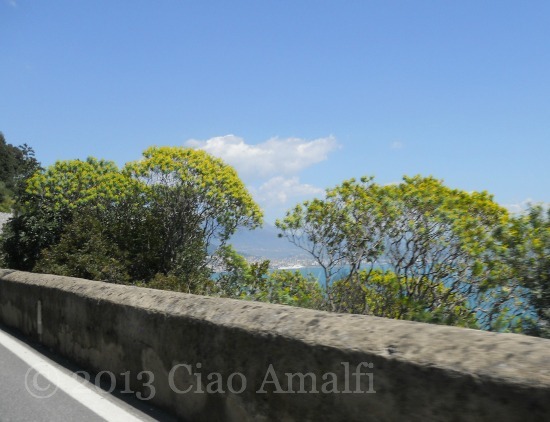 The first sunny weekend on the Amalfi Coast and everyone … and I mean everyone … hits the road for a drive. When there’s only one road, that can be problematic. 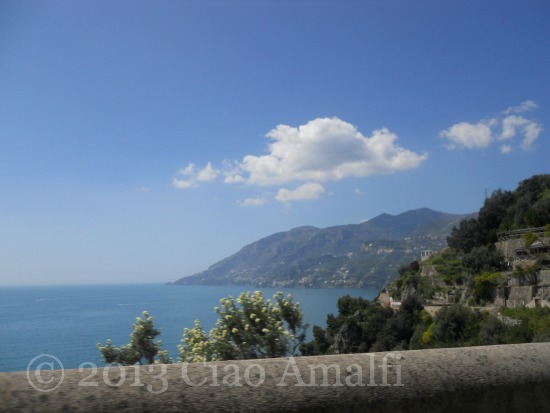 But with the Amalfi Coast road, it’s always best to pack a little extra patience … and your camera! Fortunately, there are the views and the sheer magnitude of this road carved out of the mountainside to keep one company. The colors in the springtime are a nice touch, too! A couple of weeks ago we had a Sunday lunch invitation with family in Salerno, so we hit the road along with everyone else. The scooters and motorcycles were out in droves. After the rainy spring, I can’t blame them for wanting to enjoy a ride on a sunny Sunday. What a view! 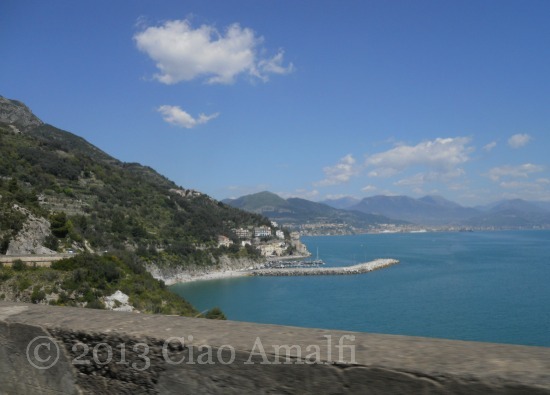 Around the curve toward Salerno! 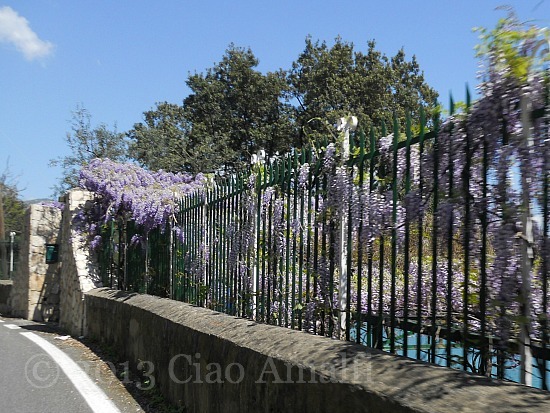 Spring was in full bloom and the scent of wisteria and lemon blossoms filled the car with all the windows open. What a heavenly scent … I wished I could just roll up the windows and keep it inside. Looking at the photos brings back the memories of that warm, spicy scent and the sunshine on my arms. After passing Capo d’Orso, the Cape of the Bear named after a bear-shaped rock, the road climbs higher and twists and turns as it winds in and out of ravines in the mountains. Before long there’s a quick glimpse of the harbor at Cetara, which is an absolutely charming little fishing village. The road curves through Cetara just above the level of the rooftops of many of the houses and about eye level with the colorful majolica tiled dome of the church. If you’re driving along the Amalfi Coast road and have time, do stop off in Cetara and explore the village, enjoy lunch and the pretty beach. One of the most captivating parts of the drive is just barely catching a glimpse of an incredible panorama and then a moment later it’s lost between the trees or around another curve. It’s one massive temptation … curve after curve! It took me quite a few attempts to get a clear shot of Vietri sul Mare, above, with its beach area called Marina di Vietri. The beach wasn’t packed like it is in the summers, but it was definitely a popular spot on this sunny Sunday. Around a few more curves and I tried to catch a clear shot of of Vietri sul Mare with the dome and bell tower of the Church of San Giovanni Battista. There it is … can you see it? 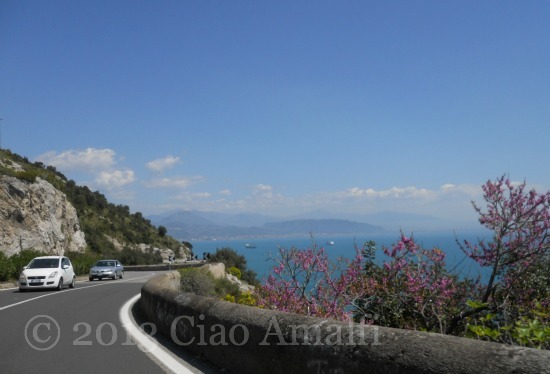 The Amalfi Coast road never fails to impress me, with it’s intense beauty, crazy curves and views that make you want to drive it again and again. If you’re lucky enough to be the passenger … bring your camera!